The Hilton Garden Inn hotel in Riyadh is located in the Olaya business district only thirty minutes from King Khaled International Airport. Airport transfers are available for SAR 150 one way or SAR 280 round trip. Please make arrangements in advance by contacting RUHROfrontdesk*hilton.com or RUHRO-SALESADM*hilton.com with your flight details. 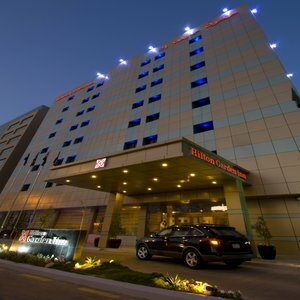 The Hilton Garden Inn Riyadh Olaya is located on the Olaya main street in the heart of the business district. All major corporations and ministries are walking distance or only few minutes by taxi which makes it ideal for business. Riyadh International Airport is only a 30 minute drive away. This 180 room hotel has everything a savy business traveler would need. From complimentary wireless high speed internet access throughout the hotel to our restaurant Oasis Grill serving Breakfast Lunch and Dinner as well as 24 hour room service. Everything you have come to expect from a Hilton Garden Inn hotel is also available with our 24 hour Pavillion Pantry 24 hour Business Centre and our fitness facilities with Precor and Stay Fit Kits. The Hilton Garden Inn Riyadh Olaya also has 230m2 of divisible function space that can accommodate up to 220 guests. There is also a 140m2 of pre-function space. meter. Please be aware that there is a large fleet of unlicensed taxi*s offering their services at the airport. The hotel strongly advises against using any unlicensed transportation provider while in Riyadh. These taxis are uninsured and illegal and the passenger runs the risk of prosecution if stopped by local police. 6. The hotel is located on your right side 200 meters after the U-turn.